My blog has been severely lacking fine dining. Today, being day one of the Melbourne Food and Wine Festival, I felt compelled to step it up. If I write about food constantly, surely I can treat myself too? This one last encouragement to socialise, fine dine, and enjoy all the activities on offer has seen me book out my schedule with Express Lunches and event dinners. Today, I found myself at lunch at Maha. Arriving to a queue descending into the basement, we stood at the bar and waited only a few minutes for our table to be set. 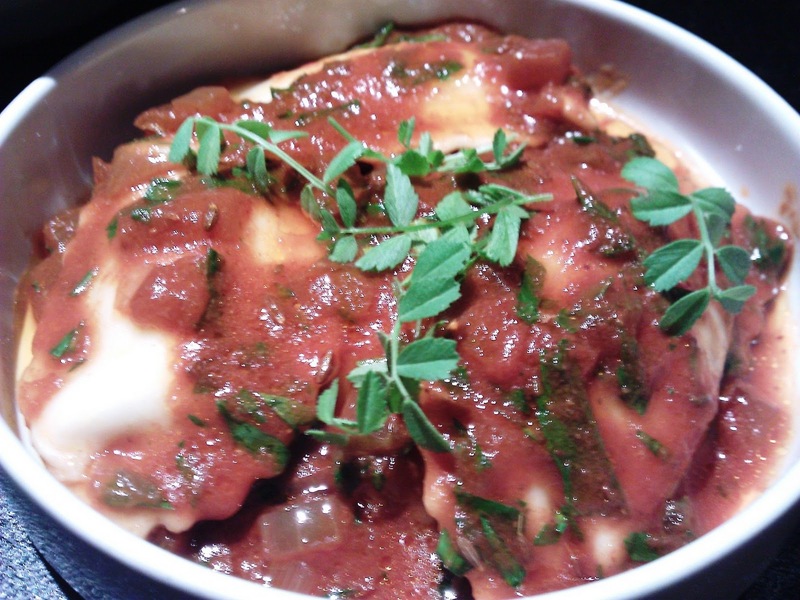 Vegetarian dishes were prescribed as an asparagus based soup for entrée and ravioli, lentil rice and salad for main. 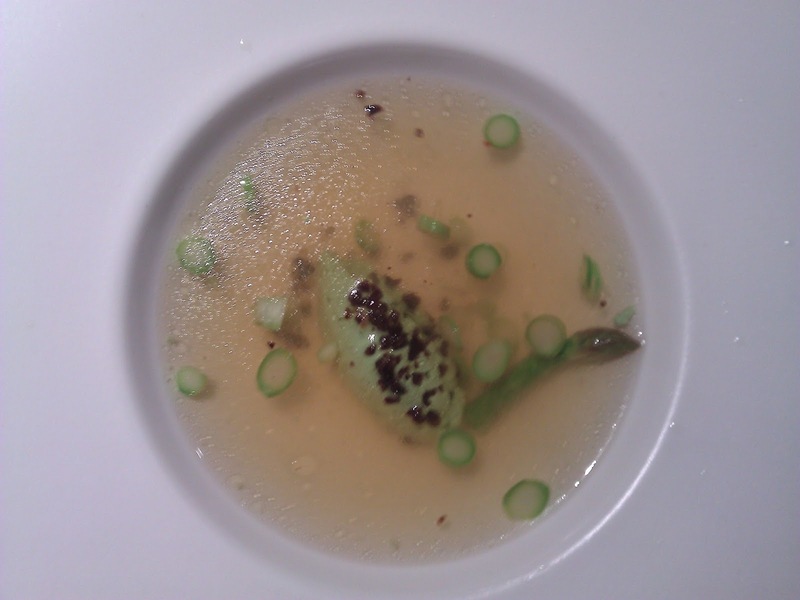 The soup arrived as an artistically placed dollop of asparagus and goats cheese puree with finely sliced asparagus rounds and dried olives. Onto this the waitress dramatically poured a hot and clear tomato and gin broth from a decorative silver tea pot. The dried olives were sweet on the outside with the full saltiness coming through after biting into the sprinklings. The flavours were strong, but blended well. The main courses were less complicated and more home-cook-able – but the flavours were still delicious. The ravioli had an interesting taste filled with ricotta and sauced with a herbed tomato sugo. Chickpea cress was used to garnish. The texture was peculiar with the ricotta clumpy and the pasta aldente. 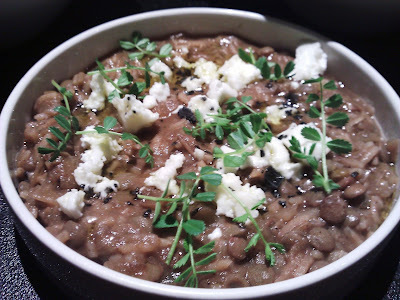 The lentils were blended with rice, fetta, cinnamon and chickpea cress. The flavours of this dish were also pleasant but the texture very hearty. 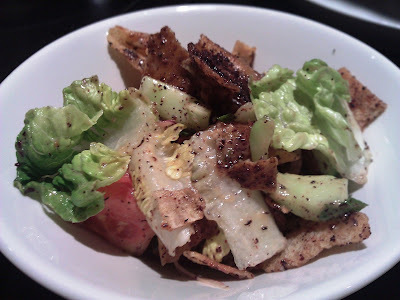 The salad was tasty with generous pita toasted with zaatar, baby cos, Spanish onion and tomato. 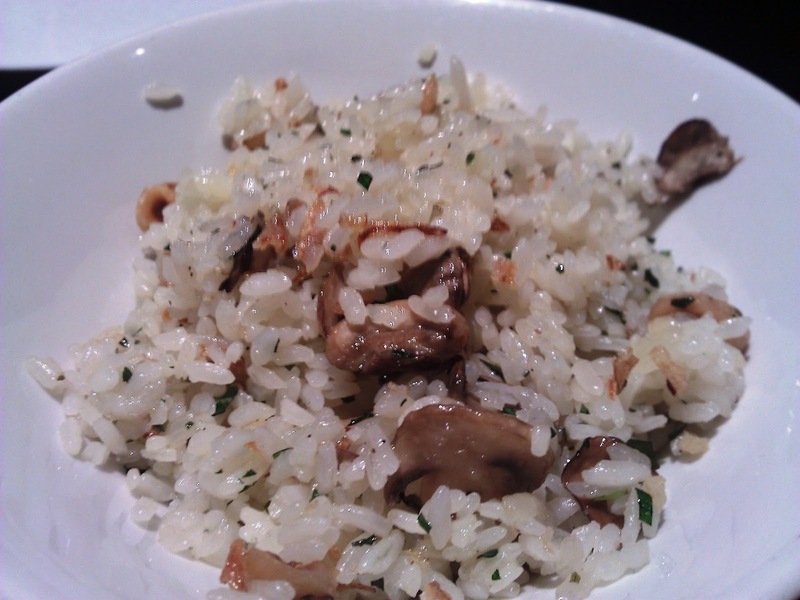 There was also rice with mushrooms and soft, warm hazelnuts. We decided to extend the two courses, glass of wine and coffee (for $35 as part of the festival) and order dessert. It was a choice between chocolate and pomegranate tart or hot Turkish delight filled donuts for dessert. I could not go past the donuts but also tried the tart. 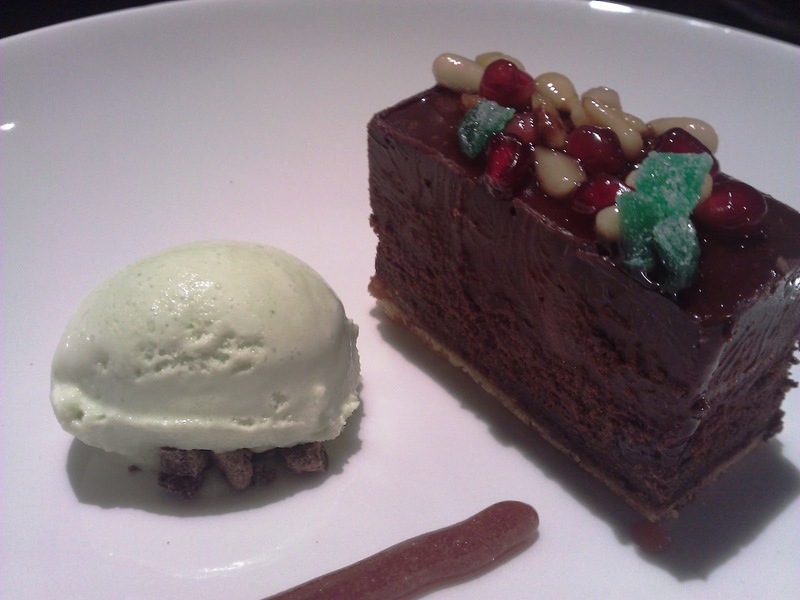 The tart was served as a decadent slab of moist chocolate with sugared mint, fresh pomegranate seeds and pine nuts. It was accompanied with an ice-cream that tasted strongly of fresh mint. The tart was rich and more like a flourless cake or dense mousse. The donuts were served hot and in a honey sauce. 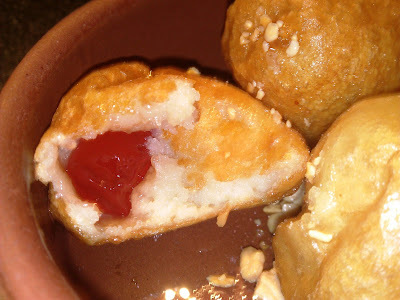 Filled with melting Turkish delight, these were heart warming and delicious. My only criticism would be that I would have expected the casing to be crispier if they were recently fried. 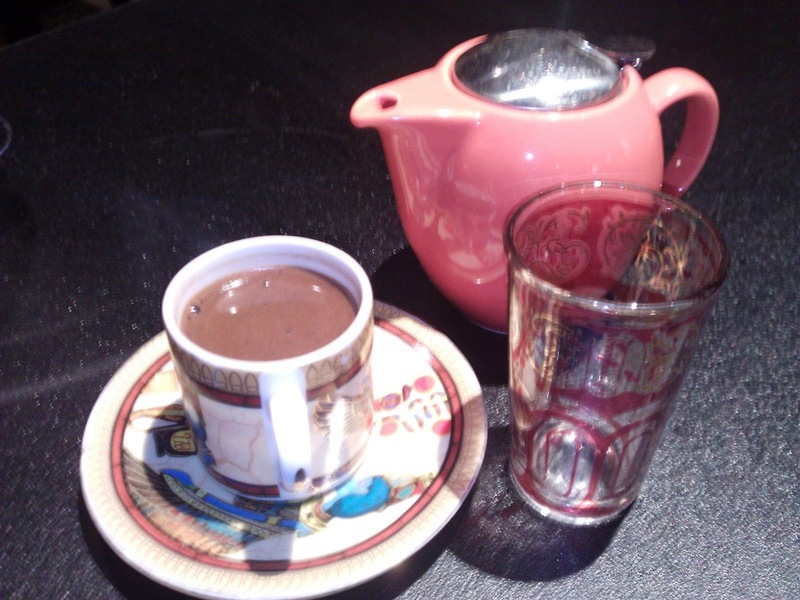 We also had Arabic coffee and Turkish apple tea. Yum. Our lunch at Maha was delicious. The service was pleasant and efficient. The space looks a little dated with the dark lighting and carpet (despite not being that old). The cutlery and crockery are middle Eastern inspired like the food. Perhaps they are now booked out for festival lunches, if not, I highly recommend them.